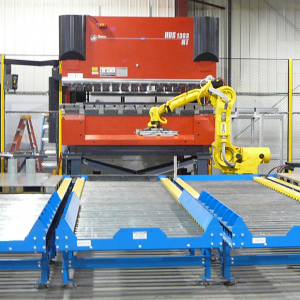 JMT’s “Standard” RIBS solution is the traditional layout with a large payload robot on a floor mounted track, positioned in front of the press brake. Our version however, expands the working envelop of the robot to accommodate multiple inbound and outbound pallets, LM RIBS style drawer units for smaller parts, multiple EOAT and re-gripping stations and even multiple press brakes! This is truly a job shop solution with unmatched flexibility to handle small to very large parts in volumes that are typical of a job shop operation.